Tell it like it is straightforward advice! There is no magic pill nor magic wand in sales. This book is a smack in the face reality check with a dose of good medicine. Mike's blunt tell it like it is truths mixed with a few real world stories really helps the reader connect to what he's saying. The advice is not new age but dead on! I've implemented many of the principles from this book and have seen amazing results. 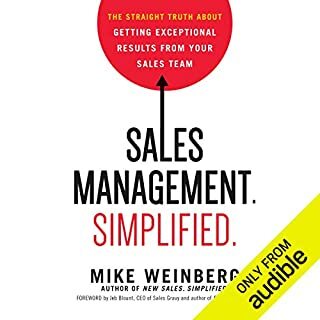 In fact, I'm reading this book again and I've listened to the audible version so I can squeeze out every piece of wisdom possible and use it with my sales team. Thank you Mike for sharing your vision with all of us!